Comments and remarks from around the World. ← Trains in supermarkets ! A few days in the sun. Pisa was better than I imagined, sure, it was bursting at the seams with tourists, but there was a certain underlying levity all around. There is this huge tower dominating the historical center and at the top it is twelve feet off, it’s like a joke passed down from the twelfth century. Many many people taking antic photos, you know, where one pretends to be holding up the tower, yes we indulged also, and I took a very good one of a solo Brazilian woman. Our hotel was immediately outside the Piazza Duomo, so the walk was all of a minute and I enjoyed the early morning walk at dawn. An early departure from the train station landed us at Monterossa al Mare on the coast, the town being one of the five in the area known as Cinque Terre. Yet another UNESCO World Heritage site. How to do it justice ? It was small, very small, an amble from the sea front to the back of the town took all of five minutes, and from side to side, even less. The main street, Via Roma, lined with tempting restaurants, shady bars and clothes shops for those inclined. Narrow alleys streamed off into the shade from side to side with the usual shutters and washing hung out to dry. Immediately behind the beach the railway line bursts out of a tunnel in the cliff before disappearing again two hundred yards later into another tunnel in the opposite cliff. Funnily enough it wasn’t the least bit disruptive, in fact watching the high speed Eurostar trains streak through for all of fifteen seconds was quite stimulating ! Even sitting outside in a bar, beer in hand, watching a train go by five feet away wasn’t in the least an irritation. The beach was the focal point of the town during the day, packed with holidaying Italians, the water was warm, the beach cafe was more than adequate. Small children splashed, moms and dads looked on proudly, teenagers played ball, grandparents sat and enjoyed the sun, it was all very charming. There was opera on a stage set into the cliffs by the quay, there was techno music outside the backpackers bar on the main street. 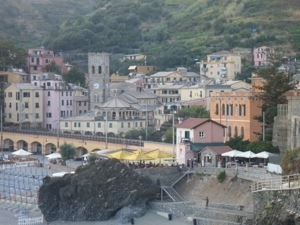 The food was flavorful and plentiful catering to the tourists who were all, fortunately, Italian. Wine was good too, half a carafe of house red cost less than a bottle of water. A Limoncella is an excellent night cap. Unless you pay very very close attention to news events you may not know that in October 2011 the whole region suffered catastrophic floods. In Monterossa the hillside in back of town slid all the way down Via Roma, ripping out the roadway and burying the whole town in ten or more feet of mud and debris. Lives were lost. People were stranded for days with no power and little or no food or water. The first relief teams to arrive, by sea, forgot to bring shovels. Outside every business there is a picture of what that premises looked like on the morning after the overnight flood. A miracle it is to see what has been accomplished since then, the aftermath is barely evident, the road surface of the main thoroughfare is made of wooden planks. We asked a restauranteur how business was looking, ” well its August the Second and we are still here” he replied, looking a bit exhausted. I think that probably goes for the rest of the populace, they must have worked furiously for months to prepare the town for the holiday season. Well done them and if you have a chance, pay them a visit, I’m sure they would appreciate it. Too soon after two nights it was time to move on again, to Lucca. The train journey had its unexpected events, like an hour detour on a bus through the Tuscan hills, studiously avoiding the direct route on the AutoStrade. Why? Never did find out. Lucca. Another of those medieval Tuscan towns, like Florence and Sienna, it has an intact wall around the old town left over from the eleventh/twelfth centuries and within it is a historical marvel. High clock towers, complete with clock, ancient villas of the merchants, fantastic churches and cathedrals, bell towers, dark alleys, illuminated arches, vast piazzas and best of all the amphitheater, now residential, but still just about circular. Much walking, much aching feet, much putting on of the sun screen, much collapsing in bars for another aqua or lemon soda. Back to Pisa and the airport I am now rocking and bumping my way back over the Alps to London. I wonder if they have recovered from Andy’s gold in the tennis or Moe in the ten thousand meters, plus Ennis, Hoy and the others who we tried to learn about watching Italian tv coverage of the Olympics. We shall see. This entry was posted in Italy, Travel and tagged Cinque Terre, Lucca, Pisa. Bookmark the permalink. Yes Sebastian, the washing line lives on. Strange how such an ordinary object provokes so much comment on both sides of the Atlantic. Over there hanging washing on a clothes line provokes comments involving living in trailers (caravans) whereas in the UK a lack of a clothes line is considered wasteful and generally unheard of. Funny old World. As you may have seen, moved on to Spain, with yer Aunt Sal. Bukhara and Samarkand, a photo journal.